A police officer was hurt in a wreck in Hauppauge, Long Island Friday night. 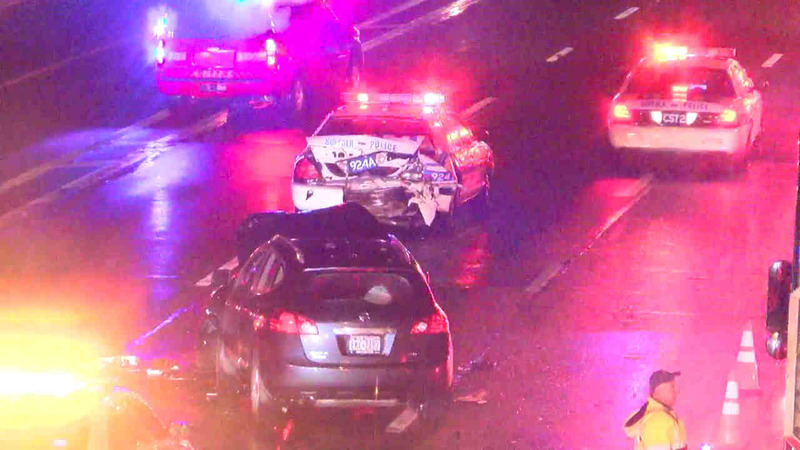 HAUPPAGE, Long Island (WABC) -- A police officer was hurt in a wreck on Long Island Friday night. According to the Suffolk County Police Department, two vehicles crashed on the westbound Long Island Expressway around 11:30 p.m.
A woman was driving a 2015 Nissan SUV when she hit the back of a marked police car between exits 55 and 53, police said. The officer had been traveling slowly, closing the road for overnight construction when she was struck. She was taken to Stony Brook University Hospital with non-life-threatening injuries. The driver of the SUV and her two passengers were taken to Southside Hospital in Bay Shore as a precautionary measure. The driver was issued summonses for failure to comply with lane directions, improper speed in a construction area and unsafe lane change.